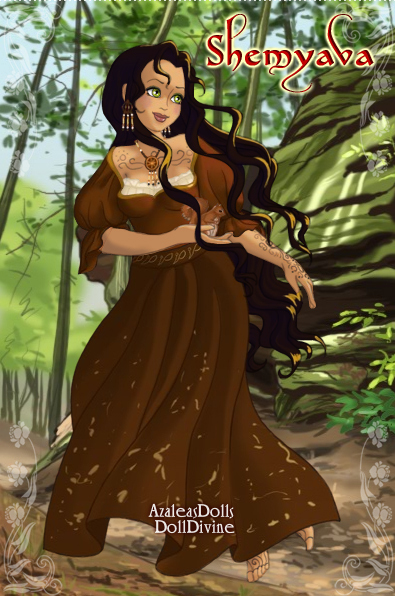 Shemyava is the wife of Adar, the leader of the Woodland Zvarocan Tribe. They have spent their lives wandering through the forests of Liliya, and entertaining in various towns to earn any money they need. They are famous carpenters and herbalists as well as musicians and dancers. She is as wise and brave as she is beautiful and she is nurturing and compassionate, taking care of strangers as she would her family and friends. She and Adar have two daughters – Telana and Melantha – and they are her pride and joy. One day while wandering through woods near the Grand Palace they encountered a group of bandits attacking a young girl. The tribe attacked the bandits and Shemyava swept into the fray and rescued the little girl then sent the girl with her own to daughters to run and hide until it was safe to come out. Unfortunately the tribe was slaughtered by the bandits – killing most in the process though, and in the end only two bandits were left alive and they were captured and killed by the royal guards of Liliya. The girl turned out to be the princess of Liliya and the Queen took Shemyava’s daughters into her care and protection and the sisters became best friends with the princess. Shemyava and the others gave their lives to save them.